You can find private holiday and villa rentals all over Costa Blanca. Simply select a house on Costa Blanca, contact the landlord of the holiday rental and make a good deal about the price. 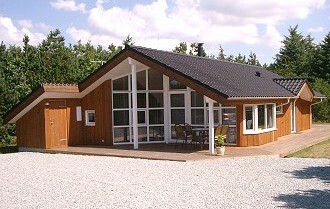 Rent you own holiday home through Cottage-rental.com. Here you will find the holiday accommodation that is exactly right for you, your family and friends. It could be a holiday house, a holiday apartment or a holiday terrace. Renting is done on a private basis and you will find accommodation along the whole length of Costa Blanca and Costa Calida. 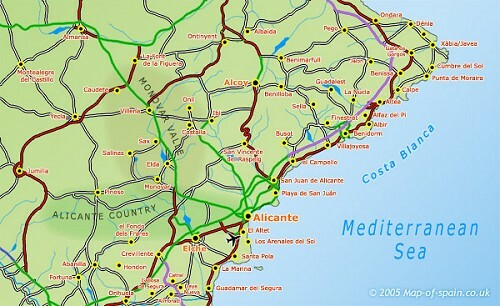 Costa Blanca is a desirable area and one of the most visited parts of Spain. It offers everything a tourist would wish for in order to have a successful and exciting holiday. It is one of the typically Spanish Mediterranean areas and enjoys a wonderful climate. This is also where you find 500 km of the most beautiful beaches offering hours of swimming and playing for the whole family. If you want to experience more of the culture and history of the area you will find ancient villages left from Phoenician, Greek and Roman occupations. The Moorish influence is particularly evident in the traditional crafts of the area. The whole area of Valencia was founded as a kingdom by King Jaime of Aragon and is still an independent region today. The main town is the university town of Valencia. It is well worth exploring the old town squares and many narrow streets in the town centre and when you are tired you will always find a restaurant to suit you needs. There is so much to explore and enjoy in this lovely holiday area and there are hotels in every price range. There are however also private holiday homes of every type for you to rent. Costa Blanca has so much to offer as a holiday destination from the towns of Aguilas and Mazzaron in the south to Cartagena, Los Benares, and Capo de Palos further along the coast. You find La Manga del Mar Menor by the large lagune called Mar Menor. Costa Calida offers many well known holiday towns such as Torrevieja, Santa Pola, Alicante, Benidorm, ALtea, Calpe, Moraira, Javea and Denia. Many of the older holiday towns have benefited from recent improvements and now present themselves as modern and attractive holiday destinations where many Spanish people choose to spend their time away from home. Inland from the coast you will find a number of attractive and interesting villages where many holiday houses and apartments are situated. You can visit Costa Blanca and Costa Calida all the year round. The spring arrives early and the weather is lovely and balmy long into the autumn. In fact the climate in Torrevieja is one of the best and healthiest in Europe. There are more than 320 days of sunshine a year. Costa Blanca and Costa Calida have many private holiday homes available to rent. Choose from holiday villas, holiday townhouses, holiday terraces, holiday apartments or fincas. 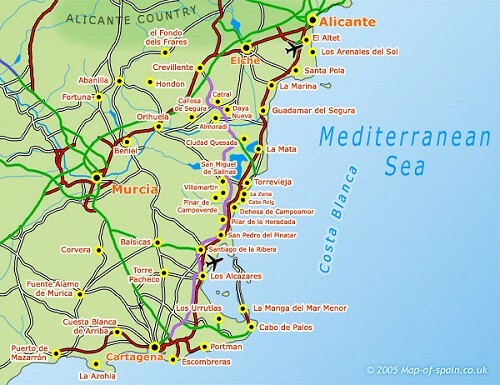 There are hotels and holiday homes spread over the whole area of Costa Brava and Costa Calida. They can be situated inland and offer opportunities for long and delightful walks in the country side or close to the coast within easy reach of rocky coves or wonderful sandy beaches. Wherever you are the weather is likely to be wonderfully sunny and tempting you to sunbathe and relax. You can rent every type of holiday accommodation. A real luxury house with many bedrooms, en suites, a swimming pool and whirlpool bath – maybe for 20 persons. A holiday house with a pool. A holiday townhouse with access to a shared pool in the grounds. A holiday terrace very near the coast. An apartment for 4 persons. It can be close to the beach with a sea view or maybe even on the beach. The choice of accommodation and amenities is yours. The private renting is easy and straight forward. You choose your private holiday home from 1.000 houses or apartments. You contact the owner of the house or apartment directly and agree the rental period and the price. The owner will probably want you to pay a deposit within a short period of time to finalise the agreement. You will find holiday houses and holiday apartment all along the coast. There are lots of holiday homes of every type for rent everywhere. Costa Blanca and Costa Calida offer the perfect setting for a golf holiday, a golf week-end or a summer holiday for the whole family. We wish you to enjoy a wonderful holiday in a privately owned and comfortable holiday home in Costa Blanca or Costa Calida. f.i. at Lake Garda, in Tuscany or Umbria, in Rome or on Sicily - see Italy. France - all you need! Holiday rentals in Provence, Southern France, Brittany etc. - see France. Find the sun in on Costa del Sol, Mallorca, Gran Canaria... - see Spain. Beautiful country, lovely islands, friendly people, sunshine... - see Greece. List your holiday home with guarantee for many enquiries... - see quarantee.